The following review was written by Messiah Young, a Chicago high school student, as part of Columbia College Chicago's Columbia Links journalism program for high school students. RogerEbert.com has partnered with the Chicago Urban League and Columbia Links to mentor these students and to give them a platform for their writing. Read more about the program here. 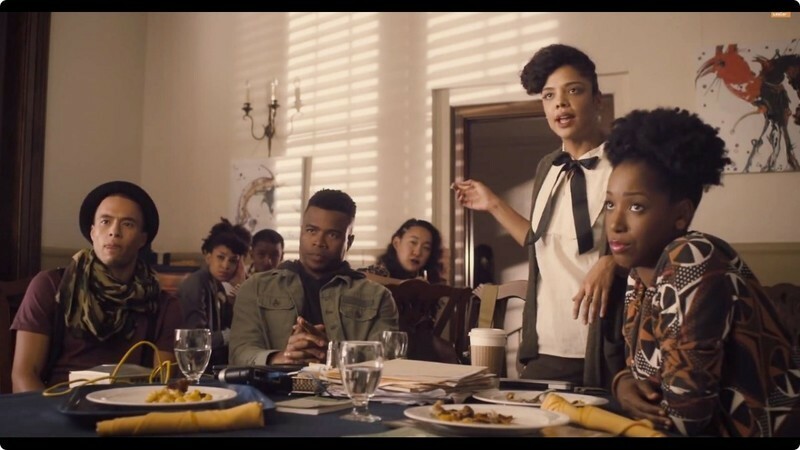 Like a spawn of Spike Lee’s “School Daze,” “Dear White People” is a satirical film highlighting the struggles and social injustices black students face during college. More directly, “Dear White People” was influenced by true events writer/director Justin Simien experienced while at Chapman University in Orange, California. The film follows the lives of four college students of various social classes, within a two-week span that leads up to the final event, a “black”-themed Halloween Party. All four struggle with identity, race and sexuality as the film progresses. Sam White (Tessa Thompson) is the host of a campus radio show titled “Dear White People.” She is a pro-black young woman, fighting for her rights on campus. She decides to run for the head of her house, the predominately black residence hall called Armstrong Parker. Unexpectedly, she dethrones her ex-boyfriend, Troy (Brandon Bell), who is perceived as an Uncle Tom by black students on campus. He is also the son of the dean and dates the school president’s white daughter (Brittany Curran), who uses him to improve her image. This relationship ends, however, when Troy has an affair with CoCo (Teyonah Parris), who is black and will do anything to be in the spotlight. She is desperately trying to land a spot on a reality television show based on black college students. She ends up emceeing the racist Halloween party in order to gain clout. The party gets shut down by Lionel (Tyler James Williams, star of TV’s “Everybody Hates Chris”), a homosexual nerd uncomfortable with his ethnicity, but who later finds himself when he attends the party with his gay editor. He and other black students tear down the party and start a race riot. By the end of the film, each character evolves into a better and more confident person. Sam accepts her racial background and embraces her white lover. Troy stands up to his strict father and gravitates toward his fellow black students. Coco still seeks the spotlight, but takes off her blue contacts, accepting her natural self. Finally, Lionel cuts his Afro and moves into Armstrong Parker; he joins the black student union and ultimately makes friends with the black students who teased him before his transition. The use of camera shots and unique angles is essential in the dramatization of this film. Close-ups are utilized often to show the emotion of characters, especially in humorous or serious moments when discussing race. Handheld shots are used when action is occurring, like a big fight that takes place at the black-themed party. This movie is a must-see for everyone, but especially for young black students, in college or soon to be. Through these four characters, Simien accurately captures the reality of black youth by choosing very specific traits, characteristics and thoughts that black people display. “Dear White People” has something that everyone in its audience can relate to, from homosexual black men to racist white women. Simien does an extraordinary job of telling harsh truths about what it means to be a black student in a primarily white setting. The film shows that black people can come together for the advancement of their race, no matter their background.